In trying to force the company’s hands, the union had produced this video as part of an on-line campaign to support the strikers I learned later. The hook had been that one of strike leaders had managed to get within earshot of Chase CEO Jamie Dimon at a Washington hearing and he had yelled back, “call my office,” and so they were. The on-line campaign involved advertisements that SEIU paid for on hundreds of websites in a half-dozen major cities around the country. I was told that Dimon did finally call the janitors back, though that was harder to clarify from a Google search. 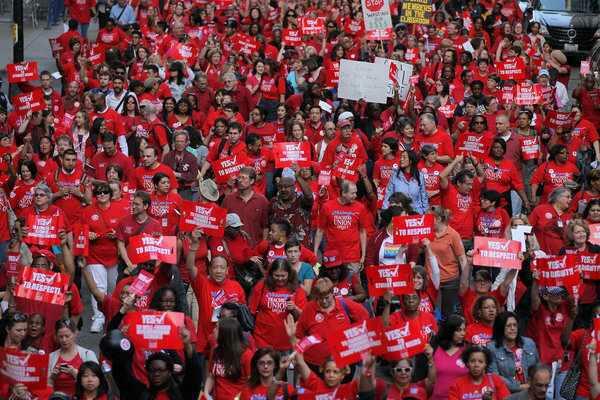 At the end of the line, Houston janitors settled after a 4-week strike involving 3000 janitors for $1 raise over 4-years, so, everything being equal which we all understand it never really is, I would say the strike was successful. And, the on-line campaign and the video tactic? Probably less so. Youtube says there were about 2000 hits on the video over the last 6-weeks. That’s respectable of course, but nothing to Jamie Dimon and Chase other than an annoyance in all likelihood and hardly a game changer. The fact that Chase and SEIU Local 1 are both headquartered in Chicago and that all of the major strike targets were big multinational companies with Houston branch offices makes it more likely that this was an old-school union pressure and leverage victory that was impossible without janitors hitting the street in Houston, but likely settled in the way many of these building service strikes are handled. The video was likely great for morale for the strikers and their supporters and absolutely another valuable arrow in the tactical quiver, but no more than that. 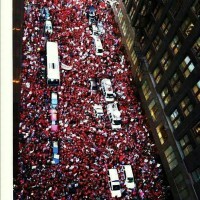 The real value is likely in the shadow of what one sees in the Chicago teachers video as a model for this type of thing. The teachers have gone from 14000 hits when I first looked 24 hours ago to over 20,000 now as I write this, but what makes both work is the fact that when the viewers like us are reached the strikers are humanized. In the Chicago case these were elementary school teachers who were obviously united, talented, and the kind of people you would love to have leading your own children in the classroom sending a message not just to Mayor Rahm Emmanuel but to their own students. You also got the feel that they had done this on their own rather than through some union public relations firm or communications department. Regardless the teachers – and the janitors – are teaching us and raising the bar. As organizers we’ve always said that “actions have to be fun,” and both in these videos set out to prove that axiom and put the pressure on at the same time.